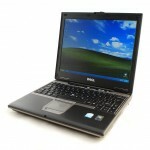 I have an older laptop here (Dell Latitude D410) that I recently dusted off to prep for an upcoming non-work trip. It had Windows XP and Office 2007, both of which are no longer supported, so I wiped it and installed Windows 7. But it is an old machine with a mere 40gb hard drive, so after the install, many system updates, and a few initial application installs (i.e. Audacity, Media Player Classic, Chrome and FF), the drive was down to 15gb free. Any more significant applications and I won’t have any space left for much else! Now, of course, I could just install a larger hard drive (and an SSD would surely improve performance)…but this is an older computer that is usable for light browsing, videos, and such things on trips…and if it gets smashed or wet, no major loss. I have Office 365 through work. I still don’t think I’d rely on that for my primary MS Office access, but it’s a terrific solution for this old D410 laptop. Now I have access to the current Word, PPT, Outlook, etc…all via ‘the Cloud’ without taking up precious HD space or having to buy another personal product license. And while still on the proverbial fence regarding Adobe’s full move to Creative Cloud, that is also a good situational solution; I installed the base CC application and installed Acrobat Pro, but left the others out there on the cloud. Should I need to install Photoshop, Dreamweaver, or any of the other available applications, I can…on the fly. Additionally, with access to Google’s applications and other storage accounts like Box and DropBox, I have plenty of options for additional applications, email, messaging, and file storage. So where all these solutions will require a decent internet connection, that’s ok for the ‘play’ purposes of this machine – and I still have 15gb free on the machine to load a few videos, music, and older games to keep the kids (and me!) occupied on the road or while waiting in the airport. While this isn’t related to eLearning specifically, I have ‘learned something’ that’s shifted my stance on Cloud-based applications. Maybe I’m not quite as on-the-fence as I was before, seeing where such SaaS applications can have their place…especially in an education setting where mass installations and licensing can be burdensome. However, I’m still old-school in the overall preference to license a product (not subscribe) and install it on my machine, locally, so I can access it as I see fit, regardless of the connectivity consideration. This is really interesting, You are a very skilled blogger. I have joined your feed and look forward to seeking more posts. Also, I have shared your web site in my social networks.